What is WBA Next Generation Hotspot Anyway? Have you looked at Wi-Fi lately? It has reached a whole new level of scale, security, and sophistication – what the market is calling carrier-grade Wi-Fi. And an industry initiative is underway to make Wi-Fi roaming on par with cellular roaming. 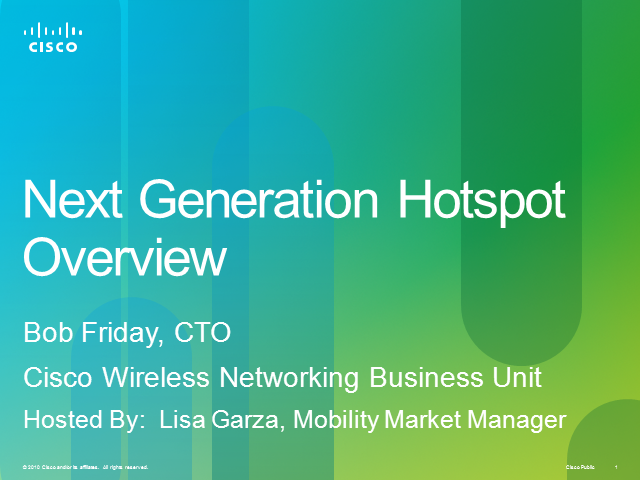 This webcast will provide an overview of the Wi-Fi Alliance Hotspot 2.0 specification and provide some insight into the upcoming Wireless Broadband Alliance Next Generation Hotspot trials. These trials will set the stage for the future of Wi-Fi, establishing it as a robust, secure technology that will augment and complement 3G and 4G networks for years to come. With the explosion of movies and TV programs available to consumers on any device, traditionally siloed content management systems are straining to keep up. Complicating things further is auxiliary content around each title such as poster artwork, chapter thumbnails, supplementary videos. Throw in to the mix music, e-books and digital comics and the content management challenges become near impossible. Unifying the content management systems is key to solving these challenges, and Cisco Videoscape Media Suite is the unified CMS leading the way. Today we see video traffic doubling each year and becoming the large majority of the traffic within a few years. Video traffic may well account for 70-90% of all traffic. -These are all occurring in an environment with video growing dramatically but facing issues of monetization and profitability. Given the above as a backdrop what and how can you address these issues both from a technical as well as business perspective? How can new emerging video processing offering help address these issues? What if any impact will they have on the profitability and the user experience? With the Internet Society (ISOC)-sponsored global launch of IPv6 fast approaching on June 6, 2012, Mark Townsley takes a look back at the progress to date in IPv6 deployment to identify some gaps that still exist in experiencing and living the next generation Internet. Have You Heard? Next Generation Hotspots are Here! -How to define the path to new revenue streams What can Wi-Fi offer to address these concerns? Find out through this webcast an innovative approach to address these questions. As cloud computing matures and hype becomes reality, on-demand services are changing the ICT landscape in all its facets. From application and presentation layers down to infrastructure and facility layers, cloud disrupts the status quo. Cisco IBSG takes a unique approach to this industry shift: we visualize the cloud value chain and its complexity, expose the main battlefields and discuss our expectations based on hard facts. More importantly, we discuss the impact on cloud go-to-market strategies for network service providers. Join Cisco (Visual Networking Index) VNI analysts in this live webcast as they share their findings and answer your mobile questions. -How fast is global mobile data traffic growing? -Which regions will grow most quickly and generate the most mobile data traffic? -What’s the effect of various device/connection types (smartphones, tablets, laptops, and M2M)? -Will mobile cloud applications be a significant factor in mobile data traffic growth? -How is 4G adoption changing the mobile landscape? The next generation video experience is moving to the cloud. Whether it is broadcast TV, user generated content, online video from aggregators such as Netflix, or direct to consumer from producers large and small. All the video you can imagine will be delivered from the cloud. It will be beyond just video new cloud based music, gaming, and other consumer services are being launched each month. These new offerings are far more than just new applications and services they represent an entirely new cloud model. The Consumer Cloud. Mobile operators are moving to all-IP LTE architectures in order to cost-effectively meet consumer demand for advanced voice, video, and messaging services. This migration is complex and challenging and operators need an architecture that is both flexible and capable in order to evolve at an acceptable pace while preserving service quality and reliability. Learn how to enable mobile operators to efficiently migrate to an intelligent next-generation mobile network for the optimized delivery of advanced voice, video, and SMS services. Mobile Backhaul networks continue to strain under the load of exponential Mobile Internet traffic growth. To alleviate the resulting financial pressure of accompanying increases in operating expenses, as well as to scale the networks to meet the ever increasing mobile broadband demand, operators must optimize and cost effectively overhaul these networks. Upgrading the Radio Access Network (RAN) is arguably the most critical investment mobile operators are making in 2010-2012 as they migrate from 2G to 3G+ to improve OPEX, increase teledensity, and unlock additional "Mobile Internet" revenue opportunities. By 2015, there will be over 5 billion wireless consumer devices and 400 million mobile-only Internet users with global mobile data traffic growing to over 3.6 exabytes per month. Service providers are under pressure to reduce data delivery costs and simplify network operations, while increasing revenue opportunities. Network evolutions, advanced mobile devices, and unlimited data plans are increasing the costs of managing this tidal wave of mobile data traffic. Cisco expects the signaling and control plane impact to be even larger than the bearer plane therefore significantly affecting policy – which becomes instrumental in making money and therefore becomes mission critical. Is your policy solution ready to handle this mobile broadband tidal wave? Join us to learn more about Policy and Charging Control solution that provides you with the ability to deliver dynamic, scalable, and customized mobile services to customers -- quickly, reliably, and cost-effectively. The Cisco Connected Life User Experience (CLUE) is a global research initiative that measures the regional adoption rates of select advanced application/services across three user categories - at home (residential services), at work (business services) and on the move (mobile services). This webcast provides a unique perspective on the advanced services that subscribers are using today. Insights into Service Provider trends and technology. Title: What is WBA Next Generation Hotspot Anyway?